What a long trip it is! If I am calculating the time changes correctly it was 31 hours in transit door to door. Portland to Vancouver BC to Manila to Hong Kong. The time in Portland airport was amazingly quiet. Our Air Canada flight was the only one going out of the whole E concourse, I think. I love looking at Mt. 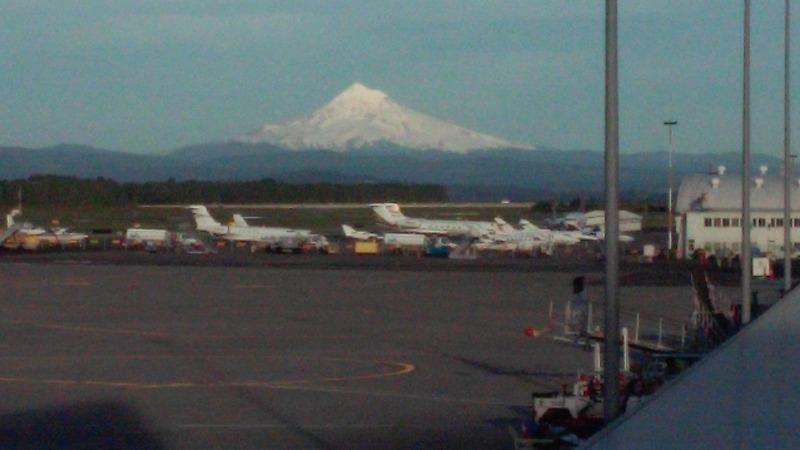 Hood any where I am but seeing it from the airport window reminded me once again how beautiful we have it in Portland. As we flew north, I got to watch the other Cascade volcanoes Adams, St. Helens, Ranier go by and fade into darkness. The arrival in Vancouver took us on a long walk. Really long for Sherry who was already tired as we began. Our back row seats meant we were last off the plane so there were no crowds to follow. We did finally end up in the right spot and another long walk to the Philippine Airlines desk to get our Manila and Hong Kong boarding passes. But alas, no one behind the desks. So met new friends as we stood on cement floor hoping for their arrival. Fortunately it was only about 45 minutes – the slowness from the plane meant shorter standing. I realized how tired I was (24 packed hours since I’d gotten up) when I forgot to take my cell phone out of my pocket before going through the metal detector. Everyone has a bucket list – high on mine and one I thought I’d never achieve is traveling across the Pacific in business class. But thanks to Dan Chalmers, a one year Faith Academy student from over 40 years ago, we had a great gift. So instead of going to hard seats in the concourse, we went to a well appointed lounge with complimentary food and drink. One sign said “hot food” down stairs. Weird since the upstairs food bar had hot food available. Of course I checked: “Hot food” was mostly spicy Korean food! When they called our flight, there was no waiting in line for a boarding call – just go ahead. And then I saw the seats: luxury indeed! Leg room – well it was so far to the next seat, it was a bit hard to see the individual TV screen. Even before we sat down, there was drinks in glasses and a server asking our choice of dinner and breakfast entree, promising snacks and anything we wanted for the duration of the 13 hour flight. I stared with a large bowl of Lobster Bisque and an entree of Braised Short Ribs in Porcine Mushroom Demi Glace for me. Sherry stayed with Grilled Chicken with Ratatouille Salad with sun-dried tomato dressing. Breakfast was similar. All was with real forks, glass glasses and endless refills of drinks. But the super luxury was being able to put the seat almost flat and sleep. Of course it is still an airplane with some pretty bumpy times, I actually slept more than 6 hours. 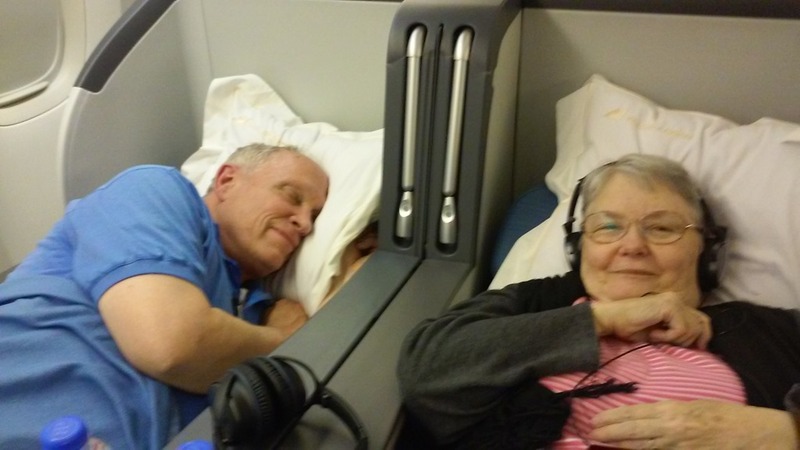 We only discovered the 120 power outlet which Sherry could have plugged her CPAP into. She may try it on the return flight. 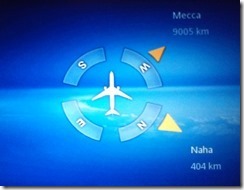 One distinctive note is that the trip map (which was my clock in the long night) regularly showed this screen. The second reference changed constantly but it always showed Mecca. 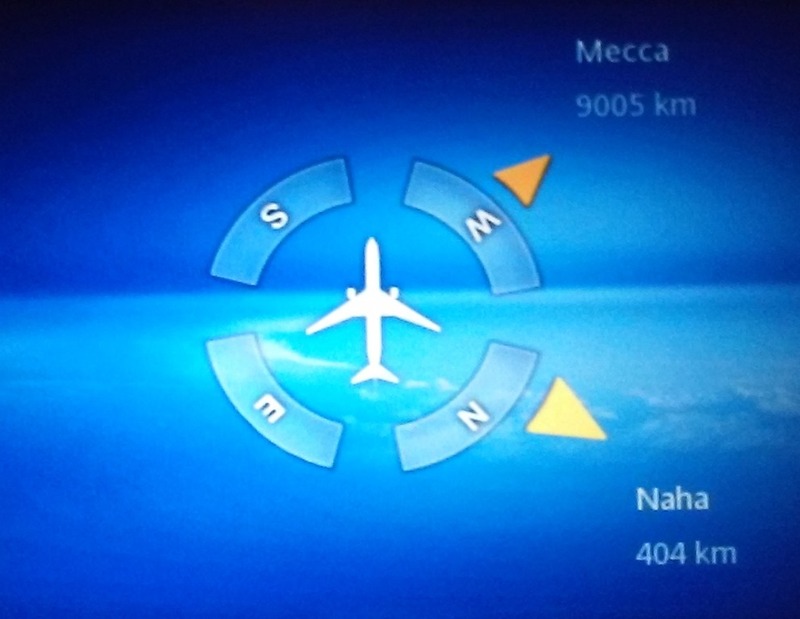 It allowed Muslims to know which way to face as the did their prayers, a constantly changing reality as the plane circled the globe. 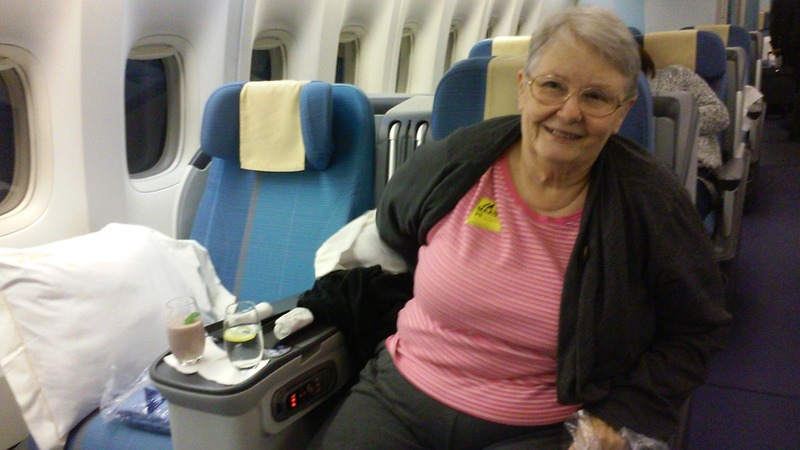 Arrival in Manila brought back many memories but they were not to be indulged this time. We’ll do that when we return on Sunday. Sherry’s cane caught attention and people clamored for the right to put her in their wheel chair. The winner took us through all sorts of illegal doors and soon we were through all the immigration lines. As we went through security again, I was literally holding the bag – Sherry’s bags. I had to take out all electronics, water, liquids, etc. and I didn’t know where they were. I got all I knew and the bags went through. Later we found an undiscovered bottle of water. Then on to another very nice lounge with lots of good food – but alas, no appetite. Breakfast was still recent. Dr Cesar Vicente P. Punzalan, III found us there. He is the chairman of the Philippine Council of Evangelical Churches and my new friend. He will be with us for the next couple of weeks as part of our team at the Justice Conference and then my leader as I do the teaching in Manila and Cebu. We quickly found many points of common interest! The short Hong Kong trip ended with a smiling lady with a wheel chair for Sherry and again, special ways through immigration. We got to the baggage claim area and waited . . . and waited . . . and waited. I had visions of our bags still in Vancouver. But finally they came and we were shortly greeted by Derek Ma, a recent Western graduate and friend and Andrew Gardener, lead pastor of the Vine Church, the host for the conference. It was great to learn his story and the church’s story as we made the long trek from the Airport to the Excelsior Hotel where we’ll be for the next four days. Sherry and I are at the Portland airport, waiting for our long trek to Hong Kong (via Vancouver BC and Manila). I’ll be speaking at the Justice Conference Asia while Sherry earns her keep at the Western Table exhibit. We leave here Monday evening, arrive there Wednesday noon (they are 15 hours ahead of Portland) with a day to get connected before the conference begins. It will be a great adventure seeing some alums and friends as well as meeting a lot of new people.